I said that I was going to catch up on my Gathering Mystery quilt, and I wasn't joking! I spent a lot of time chain piecing over the long weekend, and had a lot of ironing to do on Sunday night! For Week 8, we joined our Week 2 and Week 5 units to make one larger unit. All of the seams lined up quite well and I only had a few that I redid! That's a huge plus in my book. For Week 9, we made two different units made mainly from our Week 4 and Week 7 units. These went together extremely quickly because there were not any seams to match! Coming up next: Week 10! We'll be making full blocks and then for Week 11 (the final reveal!) we'll be putting it all together! Sharing at Let's Bee Social and Needle and Thread Thursday! 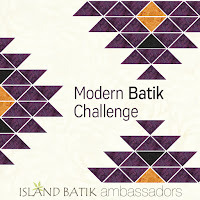 Don't forget to check out my latest Island Batik Ambassador project! For my last installment of my May Modern Mini (say that three times fast!) project, I'm sharing my finished Ombre Everest mini quilt! All of the columns except one have a spacer at the top of the "pile" of wonky crosses. 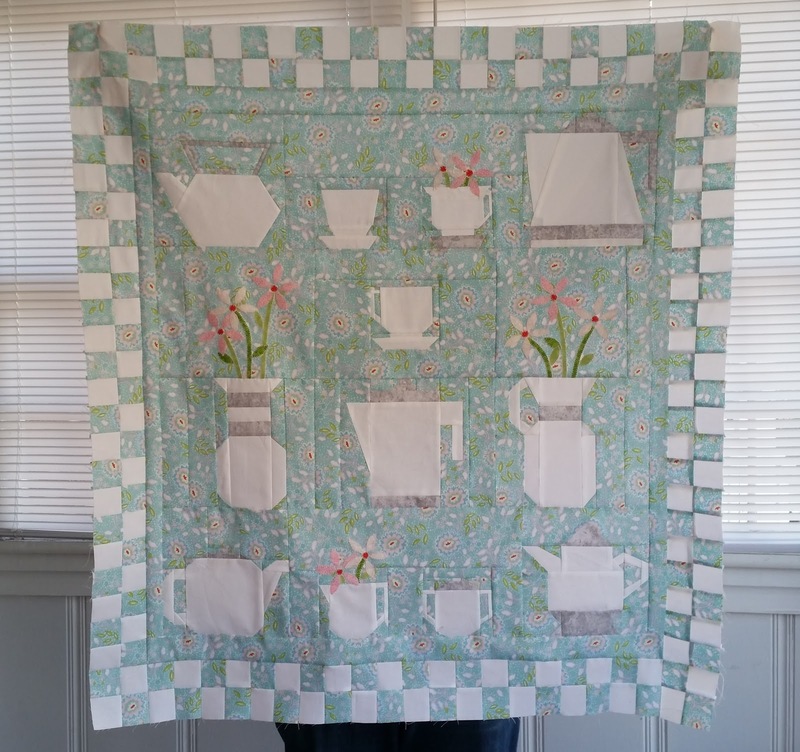 ...and so did the mini quilt top! Because the wonky crosses in every other row are offset from one another, I needed to give the quilt a little bit of a trim before I layered and pinned the top with the batting and backing. For the inside of the mountain, I used Superior Threads Fantastico variegated thread on the front. For the sky portion, I used a light blue thread from my stash. I used Aurifil 40 wt. thread for the bobbin thread throughout as well as the binding. I had already decided on how I would quilt this mini during the design process, before I had even cut a single strip! The quilting in the background echos the outline of my mountain; the quilting in the mountain are random diagonal lines through the mini quilt. I used the medium shade of purple fabric for the binding. I used the other four shades on my pieced backing. I used two 10 inch squares for my hanging pockets. They don't quite fit my purple theme, but they'll likely be hiding forever! My backing ended up ever so slightly askew but at least my quilting doesn't have any tucks on the back! And not only am I excited to have another finished project, I am excited to share that the free pattern for this mini quilt will be available very soon on Craftsy! I will update this post when it is available! Sharing at Linky Tuesday and Finish it up Friday! 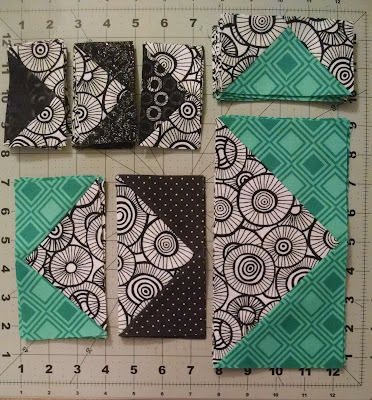 It's been awhile since I posted about my Rainbow Scrap Challenge blocks -- mainly because I haven't made any until this week! 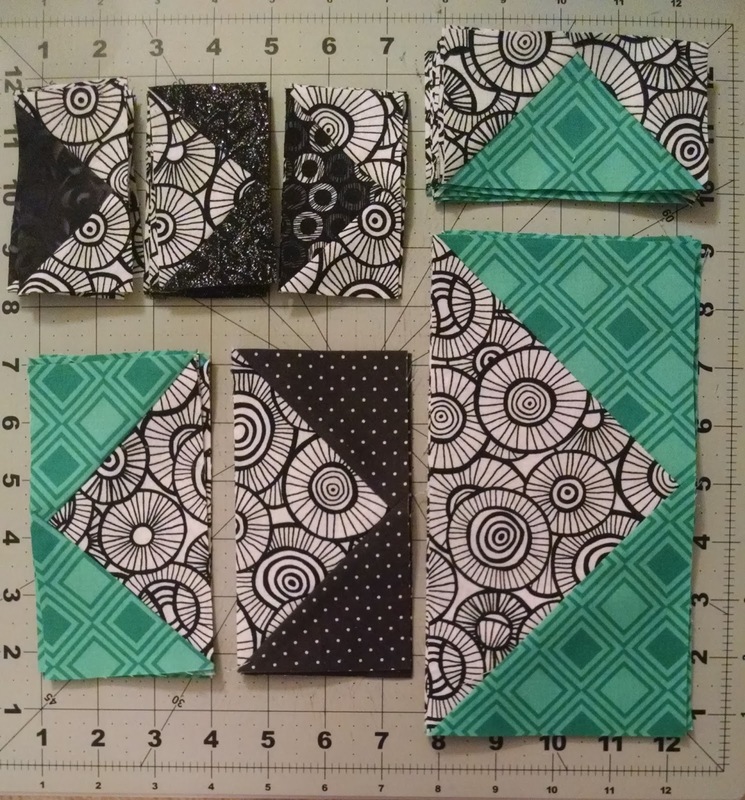 When I made my March blocks, I had used up all of my sky blue fabrics and didn't manage to remember to get more until my mom actually brought me four fat quarters when she came to visit last week! Hopefully they'll last for a good chunk of the remaining months. In April I was all set to make more blocks, and spent about half of a Sunday afternoon going through my multi-colored fabrics, ironing, and cutting all of the house sections for six blocks and then finally made them this week. A few of these houses used direction prints and I did a good job while I was cutting to make sure that the pieces would all go in the correct direction (at least, if I remembered to sew them correctly!). Normally I've only been making two of three house blocks in the monthly themed color, but I was surprised by the number of different fabrics that I had that fit the multicolored bill. While it's already time for the Week 10 directions to come out, I'm still a few weeks behind, but have made a dent in my backlog! Over the last week, I've been able to make a lot of progress on making these units and could potentially get caught up this weekend! For Week 5, our assignment was to make "half snowball units" -- blocks with stitch and flip corners on corners opposite from one another. We made large and small half snowball units. Stitch and flip corners aren't my favorite type of unit but sometimes they are a necessary evil in a pattern! I saved the corner cut-offs from the large units, but not the small units. I was a little bit worried about the contrast between my corner fabric and center fabric for my larger units, but the blocks turned out well given the prints are so different. For the Queen sized quilt, I had to make 64 of each unit. For Week 6, we made "house units" which is essentially a half square-in-a-square unit and made 80 units. More stitching and flipping on these units, and I also saved the corner cut-offs from these units as well. Week 7 was our first week of building bigger blocks -- hooray! We used our two sets of flying geese units from Week 3 and attached them to our house units from Week 6 and to our square in a square units from Week 4. All of these units had precise matching of points, but they actually ended up going together quite well! There are 64 of the units with the green and 80 of the units with the blue! Week 8 and Week 9 are taking the units we've been making in Weeks 2-7 and combining them to make larger block sections. Hopefully these will continue to go together quickly and I'll get all the way caught up before the final week of the quilt along! Sharing at Finished or not Friday! 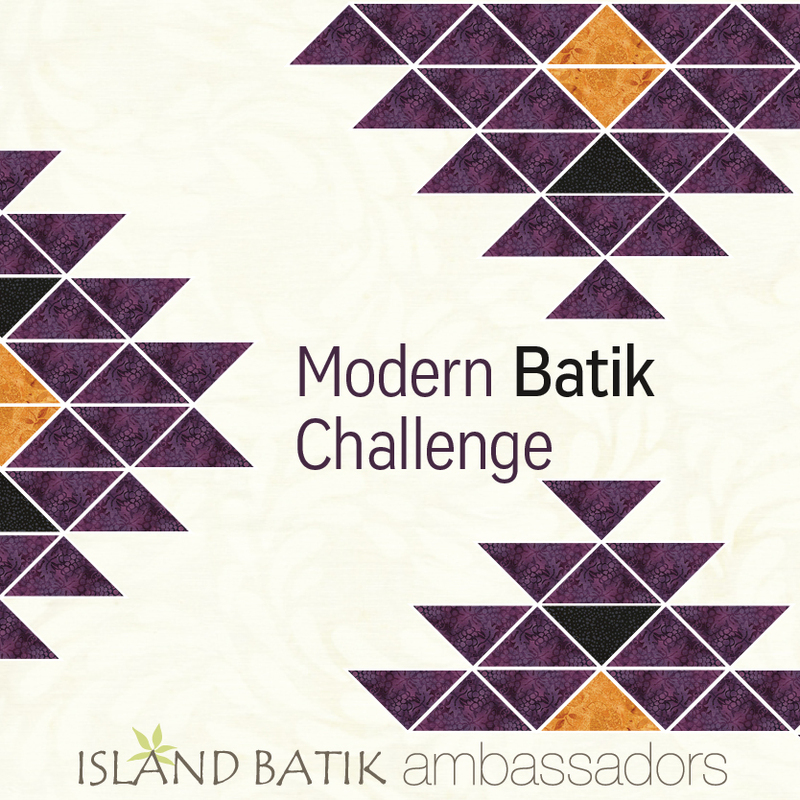 It's time for Batiks Gone Modern, Episode 2: Attack of the Wonky Crosses! To recap, I'm making a abstract Mount Everest out of wonky crosses, using 5 shades of purple batiks. Congrats, Rachel! A fun bundle of your favorite colors will be on its way to you soon! Today I'm going to talk about my process of making wonky cross blocks in bulk. 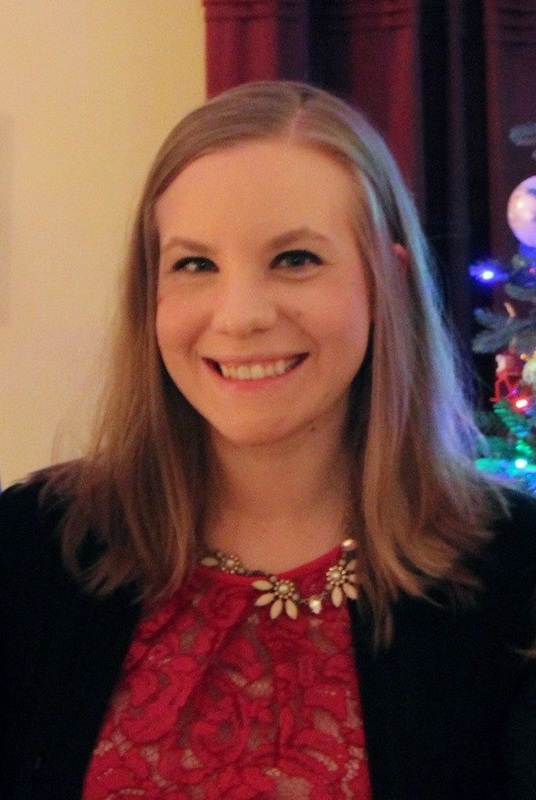 I will preface this post with the disclaimer that I am not the wonky-est blogger on the block. I think that most people will tend to call my blocks "controlled wonky" but this is who I am as a person. I'm also slightly limited because of the small size of my cross blocks -- these will finish at 3 inches square, which is the same size as a Post-It note, for scale. For the purposes of this tutorial, I'm going to be working with fabrics #3 and #4. For these blocks my darker fabric will always be my "cross" and the lighter fabric is the background. Sew both halves of the background fabric to your shorter 1.5 inch strip, pressing toward your darker fabric, aware of potential stretch along the bias. Measure the length of your new unit, and cut 5 or 6 sections of equal width. For mine, my piece was 22.25 inches long so I cut sections 3.75 inches wide. You do not need to worry a lot about the "rough ends" since we'll be trimming our blocks at the end! At this point, you can slice your block in half in any direction of your choice to create the space for the second half of your cross. I varied the angle at which my second piece crossed the first piece. I sewed all of my first half of each block to the same 1.5 inch strip, then cut the strip apart and pressed. I then added the second half of each block and pressed. Now it's time to trim all of our blocks to our desired size - 3.5 inches. You can also use this step to vary the angles of your crosses within the blocks. Most of my untrimmed blocks were about 4 inches square so I had some wiggle room in determining how I wanted my final blocks to look. Next week, I'll be posting about putting the top together and the final product! I've already planned my quilting idea out and am excited to see if it will work or not! Sharing at Tips and Tutorials Tuesday at Quilting Jet Girl, Let's Bee Social at Sew Fresh Quilts, and NTT at My Quilt Infatuation! 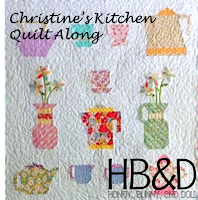 Welcome back to Week 10 of the Christine's Kitchen QAL! Today we're making the pieced border for our quilt! The most important thing about making pieced borders is making sure that you've accurately made your quilt center and that you accurately make your pieced border -- size matters, cutting accuracy matters, seam allowance matters. I strip pieced my pairs of background and print fabrics (always pressing to the print fabric) from the large scraps I had from piecing my blocks. I did mine randomly, but Amanda did hers in just two colors, which gives her a totally different look! You can also see that Amanda added in a few extra flowers to her quilt too! Make sure that your four patch sections "pair up" at the corners -- take a few minutes to make sure that your rows start and end with the correct pattern. No giveaway this week, and next week is our off week, but we will have multiple giveaways for those who send in finished quilt pictures for the quilt parade! 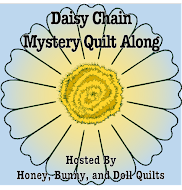 Once you've finished your quilt top and/or quilted and bound your quilt, email me a picture of your finished quilt or finished top at littlebunnyquilts@gmail.com to be entered to win some wrap up prizes! Thinking about joining in late? There is still a lot of time to catch up before the final quilt parade in June! June 5th: Show off your quilt! This month our Queen Bee was Bethany and she requested Converging Corners blocks. 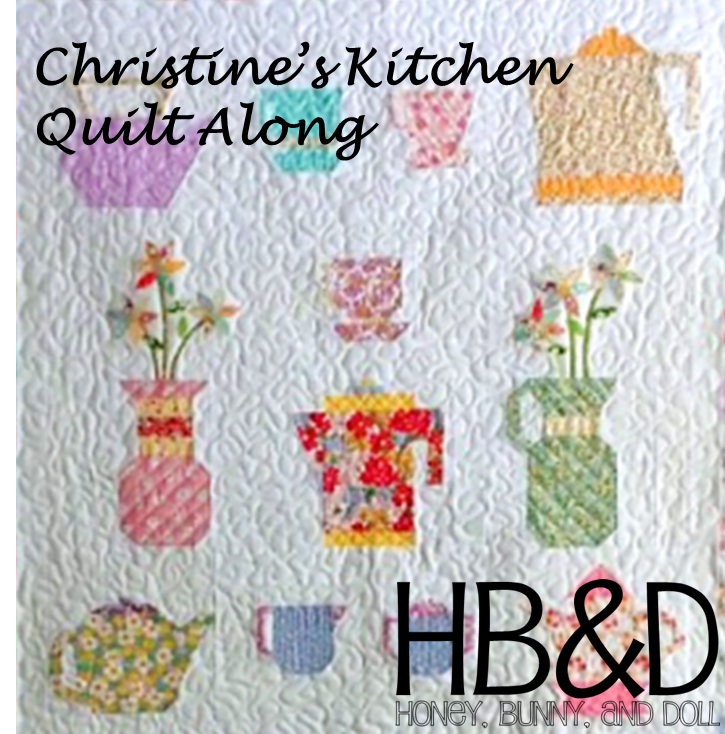 For her quilt, she wanted purple and coral fabrics with low volumes as the background. She also requested that we make 16 inch blocks instead of 12.5 inch blocks. I didn't end up having a lot of fabrics in the colors she requested, but still enough to make two blocks for her, both slightly larger than the 16 inches she requested so that she can trim them down as she chooses. I can't wait to see how her quilt comes together! Happy Sunday to you! Sharing at Oh Scrap! It occurs to me again that naming each edition of this quilt bee as a "month" is a misnomer, but it still is the easiest way to track my progress. Karen asked for individual blocks rather than blocks added to a quilt center so that she can build the quilt as she sees fit. For some reason, this has actually been harder for me, since I didn't have a center to pin to the wall and stare at for a few weeks. After reading through Karen's requests and ideas again, and flipping through the blocks made thus far, I decided that the thing I should do is make filler blocks -- lots of them in lots of different sizes -- and the best way to accomplish that was to make a lot of flying geese blocks. Unfortunately, I really only have the one teal print and I have a LOT of it (it is the leftover backing fabric from this quilt), but luckily when Karen saw these blocks she loved both the piles of flying geese and the teal fabric! The first batch of geese were mainly teal/black, and the second batch used nearly the entirety of the white and black print fat quarter. I made 56 flying geese units in four different sizes. I decided not to sew any of the units together so that Karen can manipulate them however she chooses. This will be going in the mail to Audrey today! Karen will actually be visiting Audrey while the quilt is in Pennsylvania, so they will be working on starting to assemble part of the quilt! Next up is working on Chelsea's quilt! 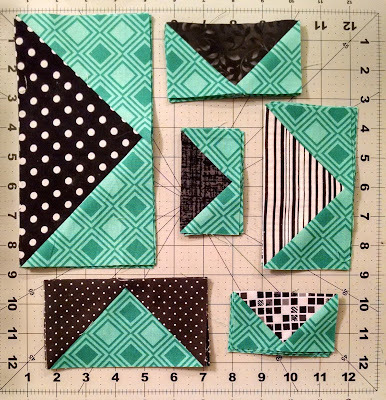 This will be another round of making blocks rather than adding borders to a quilt center, so we'll see what I come up with! I am happy to be back over at Benartex's blog Sew In Love With Fabric to share a tutorial for a quick and fun mini quilt made from the new line Anything Goes by Ann Lauer! I used mainly the green and blue prints in this mini, which finishes at 20 inches square. I used one of my favorite blocks -- the Ohio Star -- and used partial blocks to give the design a little more pizzazz. Draw diagonal lines on all of your green squares. 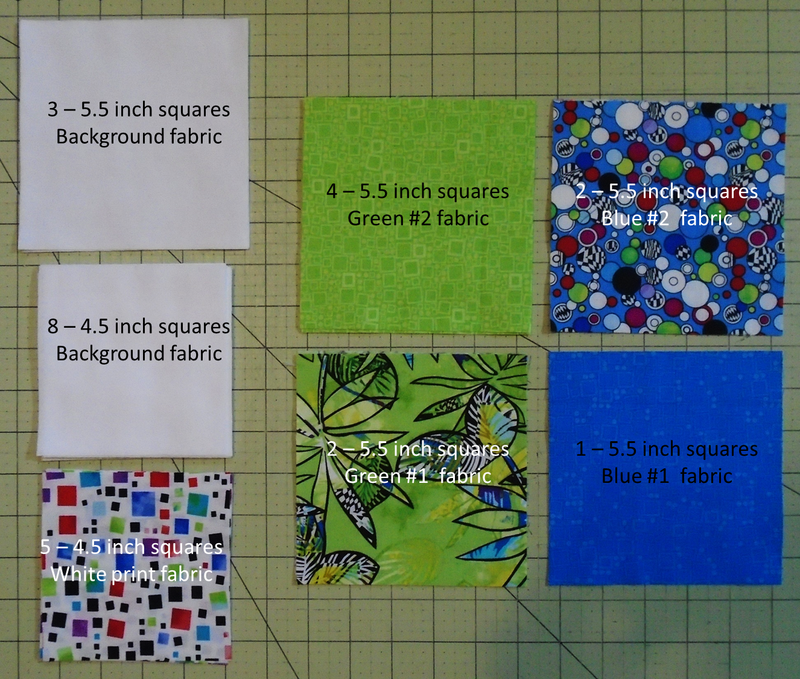 Pair up each 5.5 inch square as listed below to create HSTs by sewing 1/4 inch on each side of the line, cutting apart on the drawn line, and pressing toward the green. Do not trim your units yet. In this picture, the units that will be used for the center QSTs are in the top row, and the units that will be used for the outer QSTs are in the bottom two rows. Cut each HST in half, perpendicular to the sewn seam. Note: it is important to cut perpendicular to the seam, rather than just from corner-to-corner as this ensures nice "square" seams at the center of your QSTs. 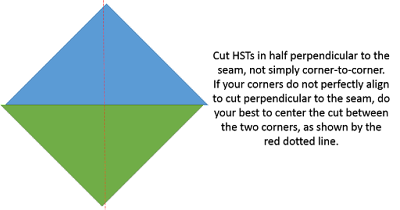 If you find that your two corners are not perfectly aligned when you line your ruler perpendicular to the seam, do your best to position the cut such that the cut splits the difference between the offset corners, as in the diagram below. After cutting your HSTs in half, pair each half with the corresponding complementary half to make your QST units. Sew together, making sure to align the center seam. Press seam open to reduce bulk and trim your QST units to 4.5 units, making sure that the center intersection remains the center of the trimmed block. Lay out your QST units and 4.5 inch white print and background squares as shown below. Sew together for your mini top. Quilt as desired and bind. I quilted my mini with a swirly flower motif. I made bias binding with one of the black prints in the collection and also used the same print for my hanging pockets. 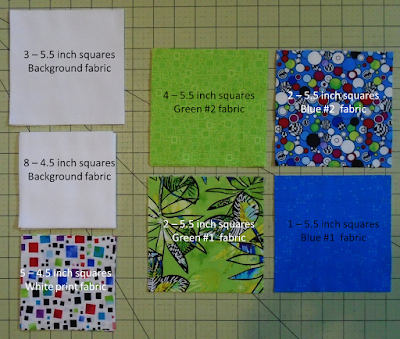 I pieced together the leftovers from the green floral print and blue dot print for my backing fabric. If you have a Quilter's Planner, you might recognize the quilting motif as the design of the week from last week! I decided to go with a swirly and round design to contrast with the graphic prints in this line. I used the black squares print for both the hanging pockets and the bias binding. This tutorial is essentially the same as what I do when making non-continuous bias binding. 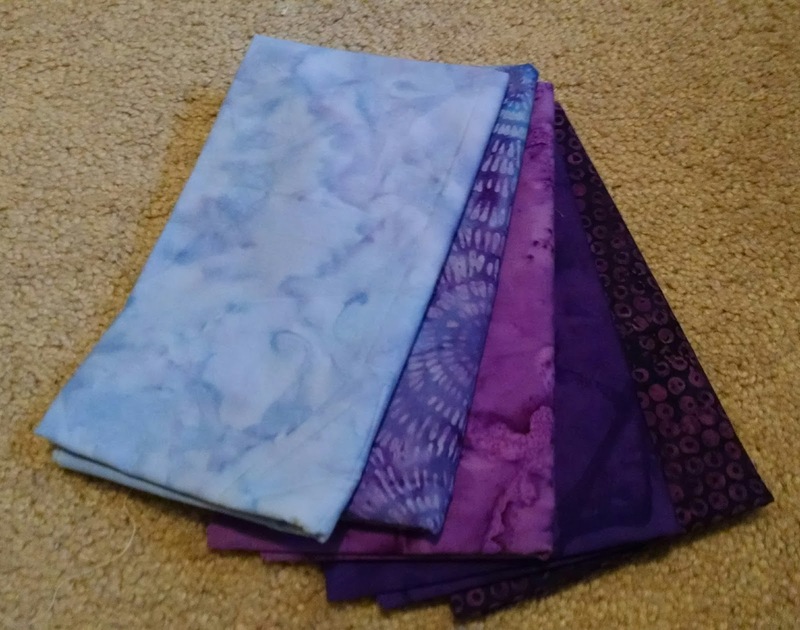 Since I was working with a fat quarter, I needed four bias strips total for binding. I use this method to add hanging pockets to the mini quilts that I make. For this mini, I believe that my pocket squares were cut to 6.5 inches. Check out my full tutorial at Sew in Love with Fabric! 1. Leave one comment and tell me your favorite summer picnic food. 2. Followers (Facebook, Instagram, Bloglovin, or any other method) can leave a second comment for a second chance to win. Congrats to our winner, Monica! I will contact you shortly! Happy Wednesday! Sharing at Let's Bee Social and Needle and Thread Thursday!